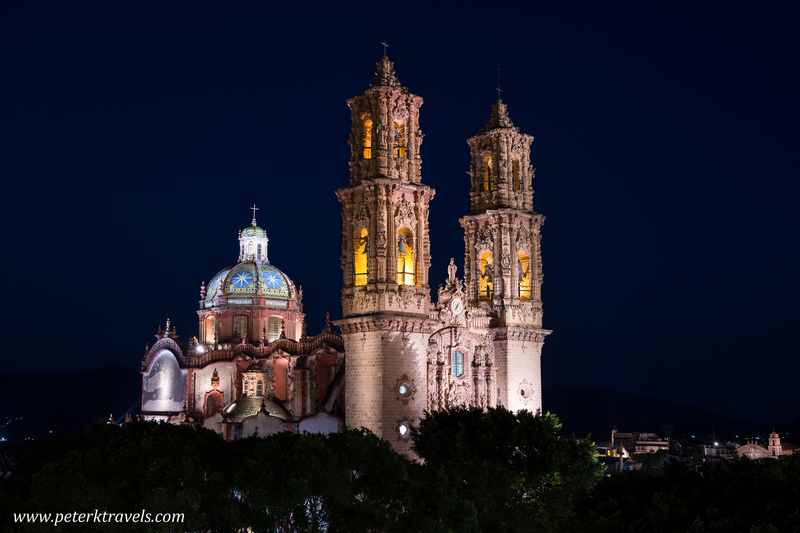 When I scheduled my trip to Taxco for February 2016, I knew I’d want to get a few good photos of the church there, the Iglesia Santa Prisca. 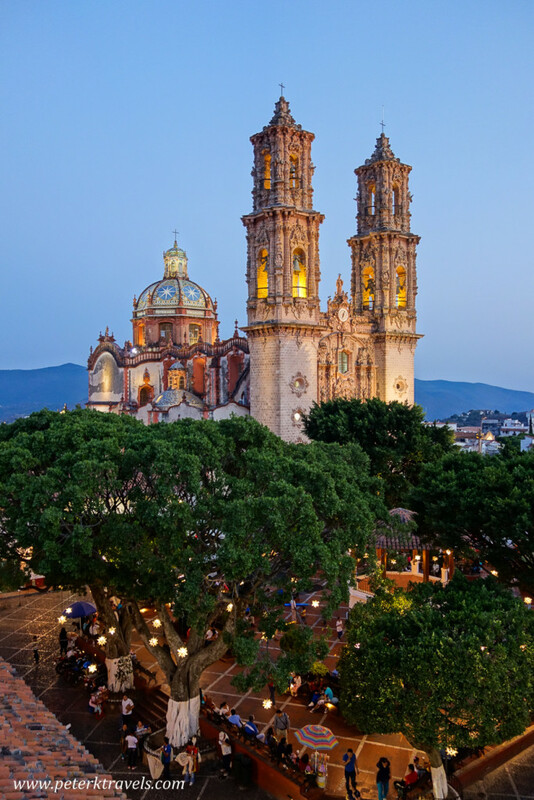 Completed in the 1750s, it is a symbol of Taxco and one of the finest examples of Mexican Churrigueresque style. Prior to arriving in a new place, I like to do a lot of research. 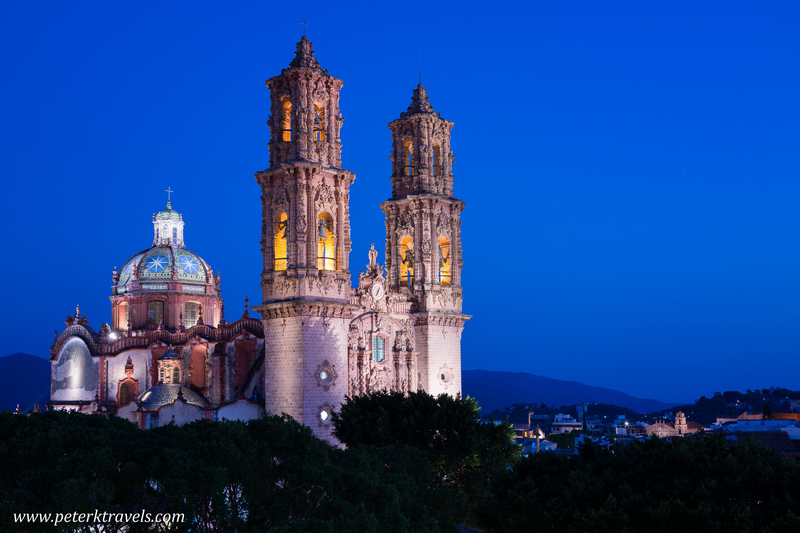 I often like to take church or city photos at dawn or dusk, or during the “blue hour” which falls around those times. The light at this time of day is often spectacular, making an ordinary photo extraordinary. The downside is that you only have two small windows each day — you really need to pick where you’ll be exactly at the right time, and you may not get another opportunity. 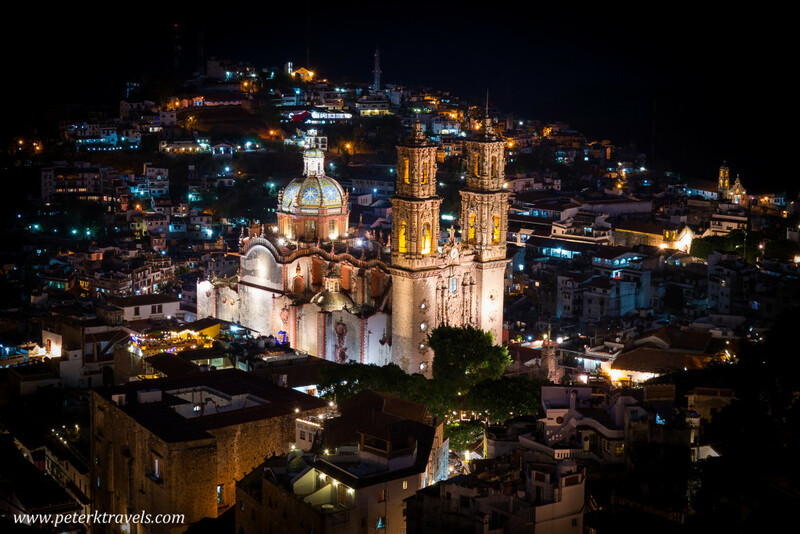 Arriving in Taxco in the early afternoon, I knew I’d have that night, the following morning, and the following evening — only three windows into the perfect shooting times. The first way to photograph the church was by shooting the front of the church from above. The red arrow shows a possible way to take this photo. 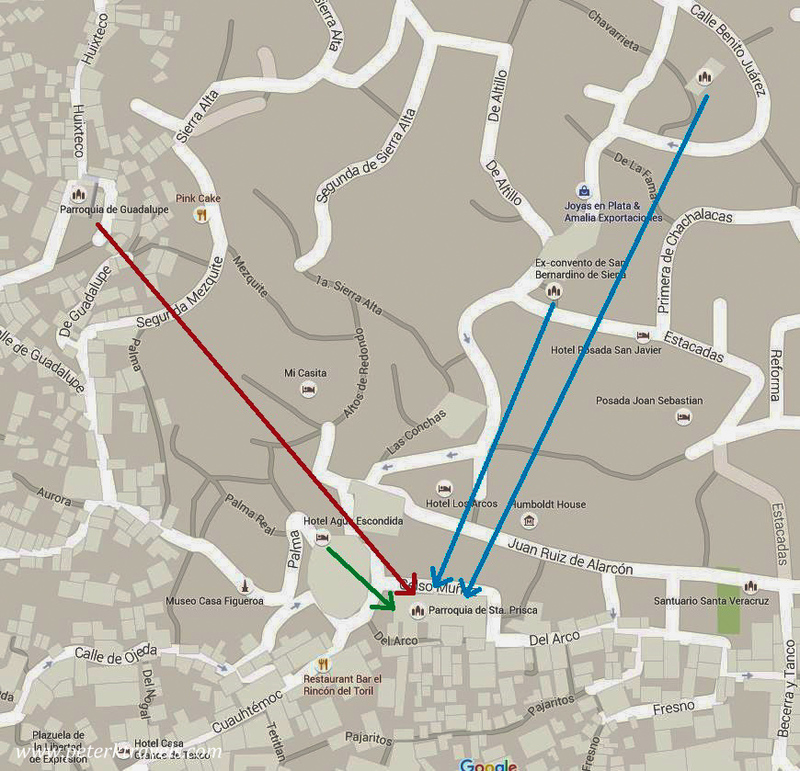 The second option, the blue arrows, would be shooting the church from below in side-view. The small green arrow is a closer-up shot from a hotel roof terrace. 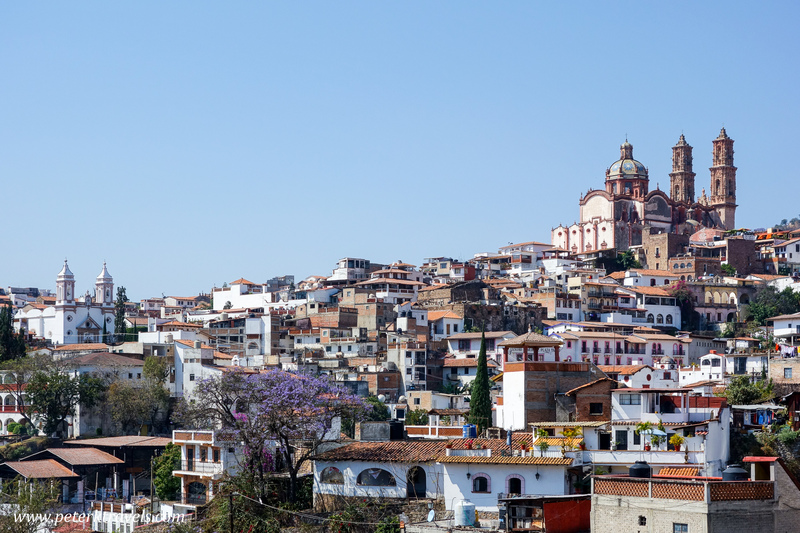 The area to the south is very built up, and drops downward — this would make any view blocked by street-side buildings. 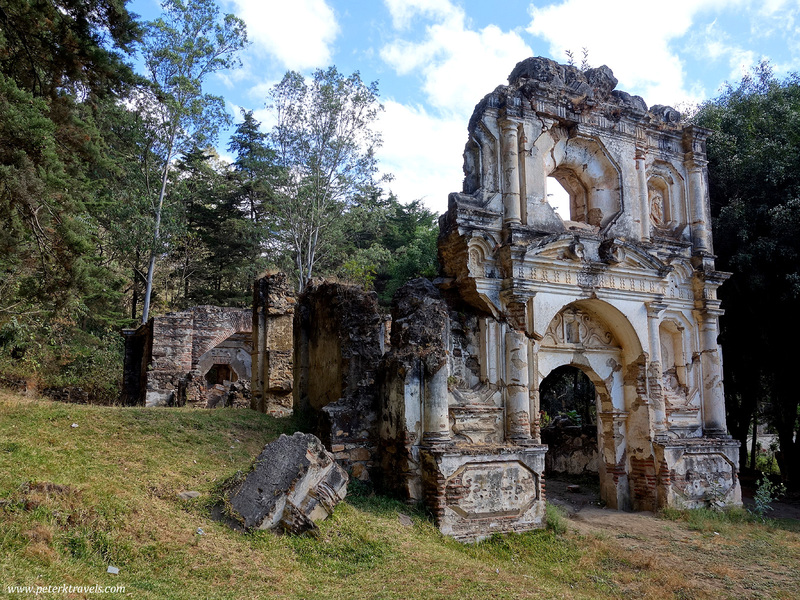 Using Google image search, there were clearly a lot of photos of this church, and many taken from the same angle — from above, with the church facing to the right, as imagined by the red arrow above. I reasoned that there must be a public overlook or plaza that people were using. 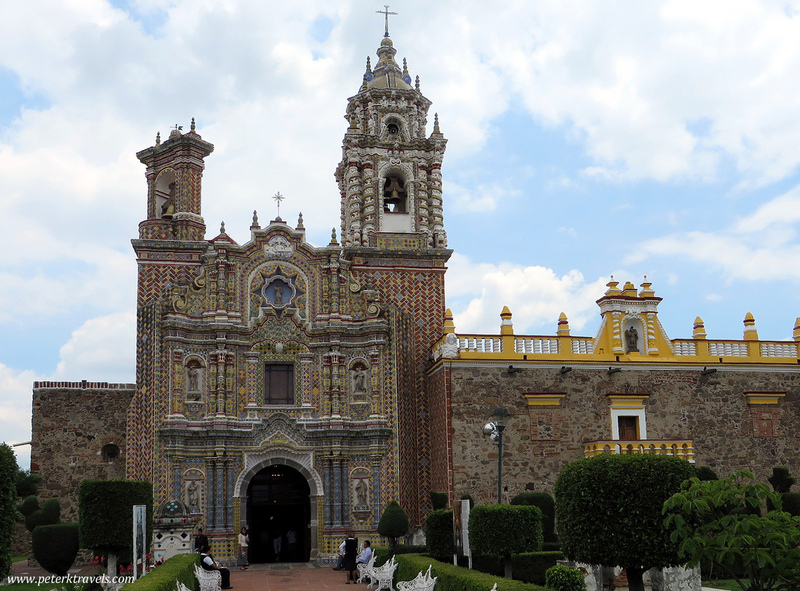 Likely, it was the Parroquia de Guadalupe church. This would clearly be a good place to station myself during one of my three windows. The church towers are slightly visible behind the small tree. It seemed this would be an excellent place to start. 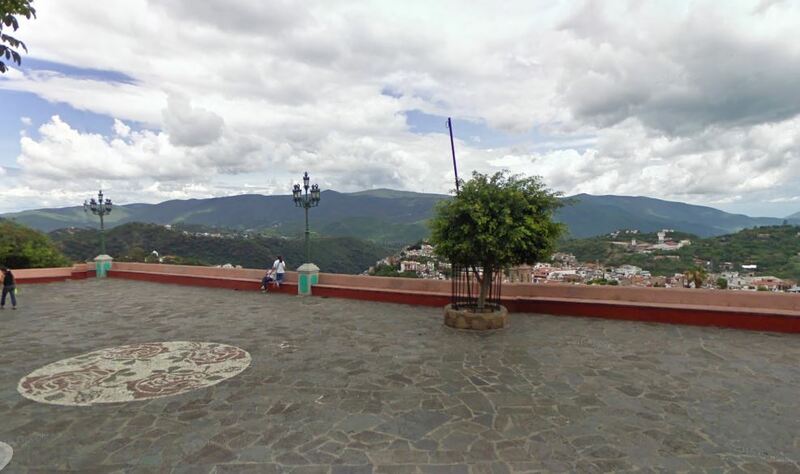 The second viewpoint, below in side-view, I could not find a suitable place using Google Street View. I decided I would have to scout this in person. It appeared there were two churches in line with this view, either might have a plaza or opening to take the shot. The third viewpoint would clearly have to come from a rooftop. 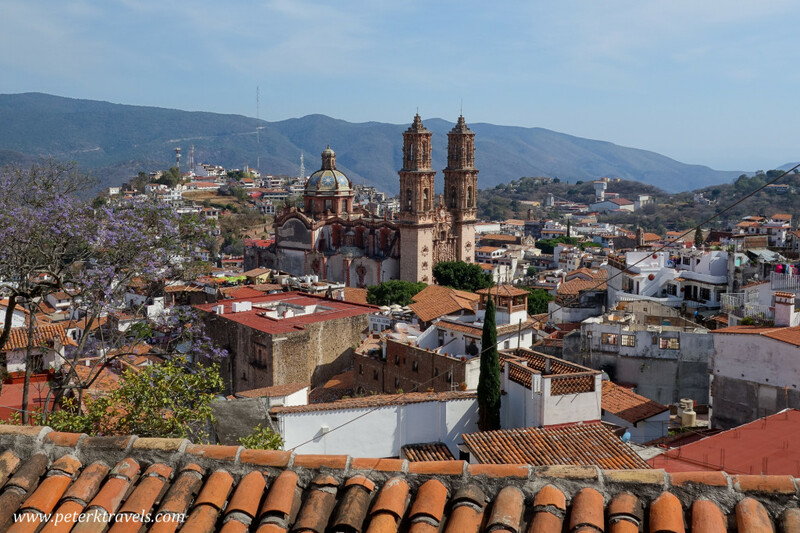 I visited the websites of the hotels around the square, and found that the Hotel Agua Escondida had a rooftop terrace, and saw photos from the terrace that looked promising. 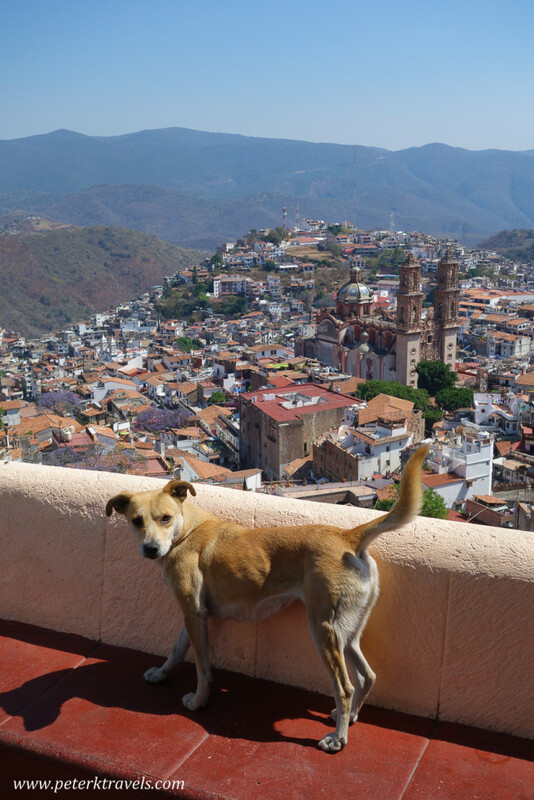 I decided to book that hotel — both because it seemed nice, and also for the potential photo. The above photo is a crop of a much larger photo. Thanks to the tripod, it’s quite sharp. And, I think the colors turned out well. Although this was exactly the view I wanted, and I would have liked to taken this photo at dawn or dusk, it was not to be. The restaurant wouldn’t have been open early enough the next morning, and I really wanted my last night to be a head-on shot from the hotel terrace. So, this daytime view will have to suffice. I love this view, particularly because I was able to put a nice tile roof in the foreground. Had I been able to place a tripod here, I may have picked this view over the others for a sunset photo. It’s not a common view, and probably would have really popped after dark. In the end, I really enjoyed photographing this church. The research and planning out of potential views really helped me focus on the best approaches when I arrived, and I was able to accomplish what I wanted in the limited time I had available. At the same time, I got some great shots that were unexpected.